John Betjeman recorded several programmes for the BBC, the most famous of which is Metro-land. Eight of his documentaries are freely available on the iPlayer, should you wish to enjoy Sir John's idiosyncratic style, including the travelogue I've chosen to feature this week. Filmed in November 1967 and first broadcast in January 1968, it's called simply Contrasts: Marble Arch to Edgware. 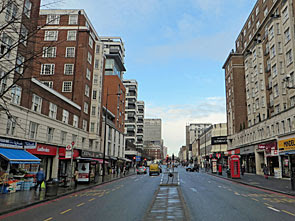 This is where we are, Edgware Road, in the heart of London. And we're Edgware-bound. We're going the whole length of the road from Marble Arch to Edgware. In this one-off programme Sir John sets off from central London and travels northwest along a transport artery, stopping off at various points of interest along the way to record pieces to camera and talk to local characters. This sounds familiar, but unlike Metro-land this half hour is in black and white, and lacks jaunty backing music, and there are no trains. The programme's subtitle is "A lament", because Betjeman spends much of his time mourning what's been lost rather than celebrating the present. But Contrasts is also a charming reflection of its era, and includes four poems written especially for the programme, of which this (delivered from the top of Marble Arch) is the first. It's not his best. Oh Edgware Road be our abode, and let us hear your message. Marble Arch: When Betjeman came to Marble Arch in the late 1960s, this corner of Hyde Park had already been despoiled. The gyratory system we know today had been carved out a few years earlier, looping round a patch of lawn and a trio of concrete fountains. Sir John chose not to mention the Odeon cinema on the corner of Edgware Road, which had been reopened earlier that year with the largest screen in the country, though a brash ribbed box viewed from the outside. He also skipped over the site of the Tyburn gallows, once the focus of the baying mob, now reduced to a stone plaque in the centre of a traffic island. Instead he hid himself inside, and then on top of, the Marble Arch itself. 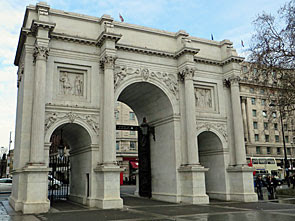 This triumphal structure once stood outside the front of Buckingham Palace, but was relocated here at Cumberland Gate during the enlargement of the royal residence around 1850. It then took on a new life as a police station, which is how Betjeman describes it on his visit, though the cameras show an empty room used only occasionally, with a stepladder required to reach the vantage point on the roof. If you've ever wondered where Trafalgar Square's pigeons went after their eviction, many seem to have decamped to Marble Arch. They perch in numbers on the benches, which you'd be foolish to sit on, and flock to land by the feet of any visitor dispensing bread. Arrive in damp weather and the pavement has the consistency of dilute guano; arrive in wet and the squelchy coating might have washed away. Across the grass a giant bronze horse's head balances in front of the bus lane, again a favoured haunt of mucky birds. And humanity flocks through - mostly tourists because there's no great reason for Londoners to be here on this side of the traffic island. They selfie themselves in front of the great arch, and some walk through to admire the intricate triple-height iron gates. But few enter the two smaller archways to either side, half-gated off, to discover a unmarked door in each supporting pillar. These would have been the entrance when the Park's constables were stationed here, and also Sir John's exit point as he tottered down from the roof and crossed the gyratory to catch a number 16 bus. Edgware Road: The first half mile of the A5 follows "that part of the Edgware Road which everybody thinks IS the Edgware Road, just faceless shops and flats." The shops and flats are still here, but perhaps a little less faceless now thanks to the Middle Eastern communities that ply their trade. Restaurants open out into the street with shisha pipes lined up beside the tables, even in January, and the shopfronts are as likely to be in Arabic as in English. It's a cosy place to hang out, perhaps picking up a Lebanese breakfast or mulling over your next luggage purchase before nipping into the Grosvenor casino. And yet ordinary high street stores survive here too, only just round the corner from Oxford Street, should you need an Argos, Waitrose or large M&S. Betjeman's documentary shows a large fibreglass sculpture adorning the exterior of Marks and Spencer - Progression by Bainbridge Copnall - long gone as the rebuilt store has no need. Indeed much of this stretch has been wilfully redeveloped in brick and steel, although many tall thin ornate Victorian villas survive inbetween. Sir John struggles to say anything nice about the Marylebone Flyover, eventually resorting to "modern, clean lines, I suppose". This concrete span had opened only a few weeks before filming - officially on 12th October 1967 according to the plaque on the side. Charitably it removes a large volume of traffic from the street below, more realistically it's an eyesore that allows fast-moving vehicles to belch high-level pollution across the surrounding area. 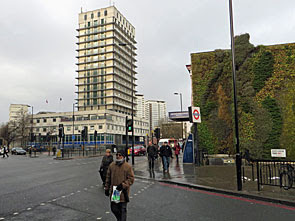 To help counter this TfL have constructed a Green Wall on the flyover side of Edgware Road tube station, most attractive and eco-friendly, but one suspects more as a token gesture than anything particularly effective. Meanwhile the Sixties planners' vast underground subway goes almost unnnoticed. They expected pedestrians would need to descend beneath this mega-junction to make progress, but most now choose to use surface level crossings and the subway is an eerie ghostworld of brightly coloured walls and futuristic (but very closed) kiosks. Paddington Green: In the documentary Betjeman spends some time standing beside a car park and eulogising about what used to stand here - the Metropolitan Theatre. This music hall favourite opened on Easter Monday 1864, its architecture designed both to dazzle and to pack in as many seated punters as possible. They all played here, your Arthur Lloyds, your Marie Lloyds and your Max Millers, until the venue's final night on Good Friday 1963. A few years later Sir John is aghast that the building's demolition has created nothing more than a squalid yard to park cars, but if he'd waited as long again he'd have discovered an even more famous building on the site, namely Paddington Green Police Station. Often described anonymously in the press as "a secure central London location", its sixteen basement cells are often used to hold terrorist suspects and anyone else the government wishes to hide away. Up top a very-Sixties tower block looms down, scanning who knows what, and the entire edifice manages to be both very bland and very creepy at the same. Somewhat ironically, an enormous development site adjacent to the police station is still a car park, and has been for over 20 years. Various plans for highrise towers and a Sainsburys have been devised and blocked and stalled, so a vast tract of prime brownfield lives out its life as a £15-a-day parking lot. In a diversion to demonstrate that not everything about the past was great, Sir John then leads us across the road into Penfold Place where five Victorian tenement blocks survive. Improved Industrial Dwellings, 1884, the plaque says, though Betjeman wonders how gardenless flats in the sky were an improvement on the little old London house then visible at the end of the courtyard. A one bedroom apartment at Miles Buildings is more desirable now, though still borderline affordable, with one intervening courtyard decorated with blue earthenware urns for that added post-poverty touch. Thank goodness the next location up the Edgware Road was more to his liking... but I'll not be following him there until tomorrow. For spoilers, or simply a damned good nostalgia trip, you can catch up on Betjeman's documentary here.